I hate admitting it but this is the first sleek product I've ever tried, i'm really not sure why as I've heard so many good things about the brand and their products. Although I can tell you this will not be my last!! Pretty in Paris - A super creamy pearly silver. Meet in Madrid - A muted gold with the same formula as Pretty in Paris. Court in Cannes - A metallic cool toned bronze One of my personal favorites from the palette. Lust in La - Another metallic this is a cross between a olive green and a bronze. Romance in Rome - A lesser pigmented shade although when layered is a beautiful Navy blue that reflects purple in some lights. Propose in Prauge - The only true matte in the palette a cross between a peach and a red-brown. A vow in Venice - A duo chrome shade can appear more brown/red in certain lights. Marry in Monte Carlo - A metallic pink with purple tones. Honeymoon in Hollywood - A gorgeous deep matte cranberry with silver glitter can be a little chalky and dry. 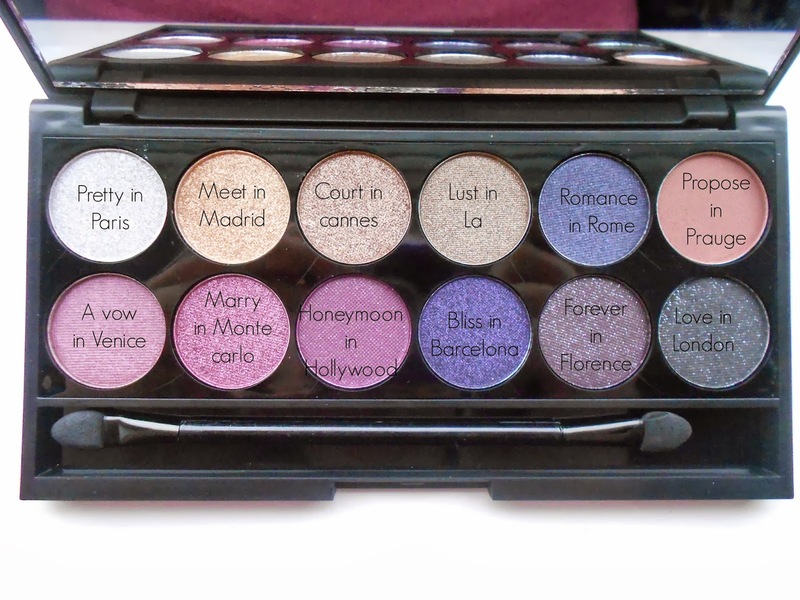 Bliss in Barcelona - Again a little less pigmented but never less is a beautiful metallic royal purple. Forever in Florence - Another matte shade with glitter this is a deep browny purple with silver glitter a favourite of mine. Love in London - A green toned matte black with silver glitter again it can be a little dry. I love this palette its so perfect for Autumn/winter, I can see myself getting a lot of wear out of it. Gorgeous colours, I normally go for more matte colours though. Propose in Prague is defiantly my favourite, can't beat a matte!